10371 ND DAHOMEY (1965) Handshake*. People*. Set of 2 imperforate margin pairs. International Year of Cooperation. Scott No C27, Yvert No PA31. 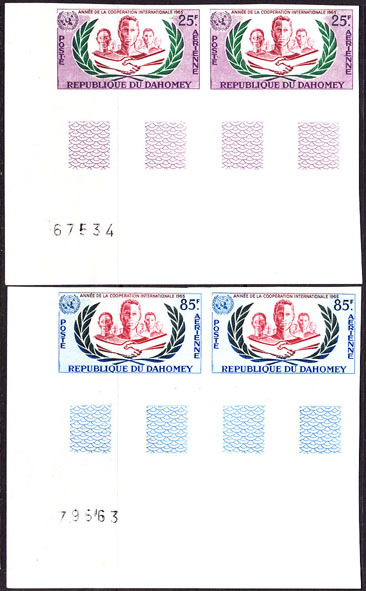 3546 ND DAHOMEY (1966) Birds*. 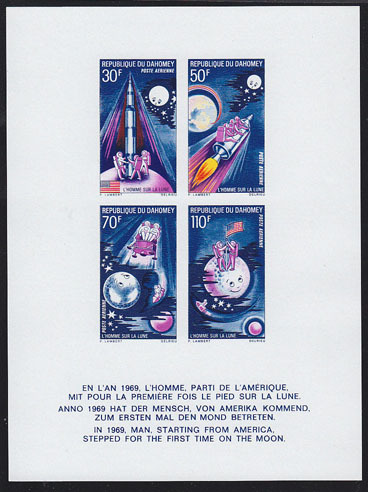 Complete set of 5 imperforates. Scott Nos C33-7, Yvert Nos PA37-41. One of the most beautiful bird sets of Africa! 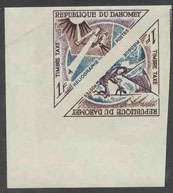 11818 ND DAHOMEY (1966) UNESCO emblem*. Set of 3 imperforate margin pairs. Scott No C43, Yvert No PA47. 5523 ND DAHOMEY (1967) Heliograph*. Mail Boat*. 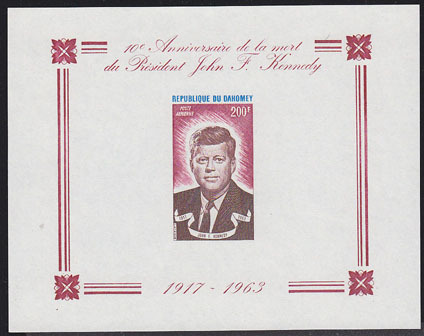 Imperforate corner copy, postage due issue. Scott No J34-5, Yvert No TT37-8. Hard to find! 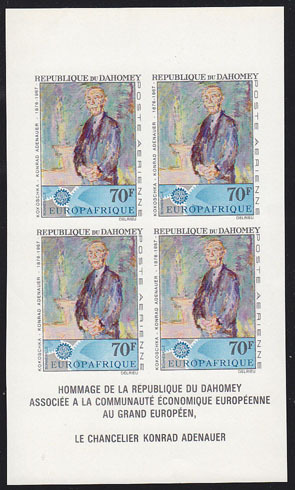 7132 ND DAHOMEY (1967) Konrad Adenauer*. Deluxe proof of S/S, on heavy paper ungummed. Scott No C58a, Yvert No PA62. 8128 ND DAHOMEY (1967) Scout Jamboree*. 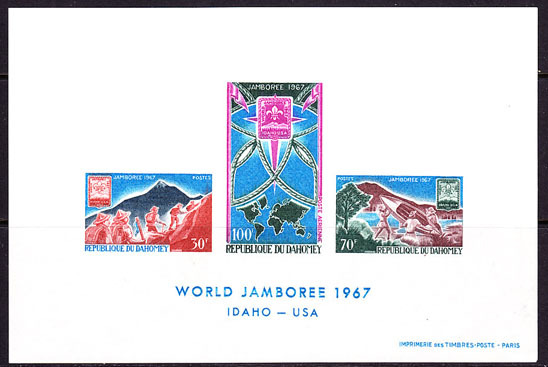 Imperforate souvenir sheet celebrating 12th Boy Scout World Jamboree. Scott No C59a, Yvert No BF9. Scarce! 8186 ND DAHOMEY (1967) Man in Space Pavilion*. Imperforate gummed sheet. Scott No C57a, Yvert No BF7. 8188 ND DAHOMEY (1970) Moon landing*. Imperforate minisheet of 4. Scott No 118a. 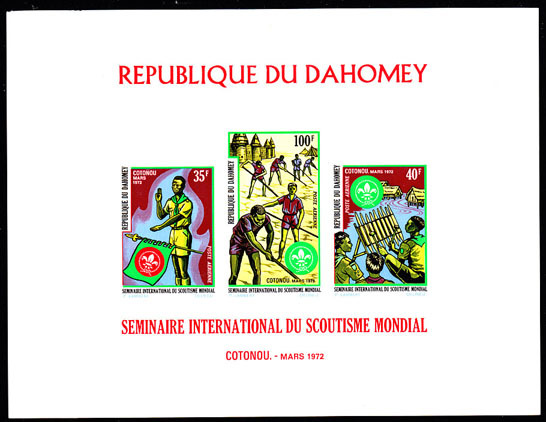 11157 ND DAHOMEY (1972) Scouting Cotonou Jamboree*. Imperforate M/S of 3. Scott No C156a, Yvert No BF18. 7522 ND DAHOMEY (1973) J.F. Kennedy*. 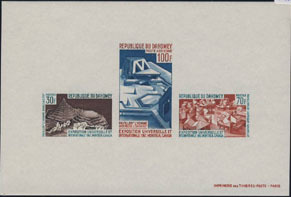 Imperforate souvenir sheet. Scott No C191a. 17116 ND DAHOMEY (1973) Scouts in canoe*. Scouts building bridge*. Lord Baden Powell*. 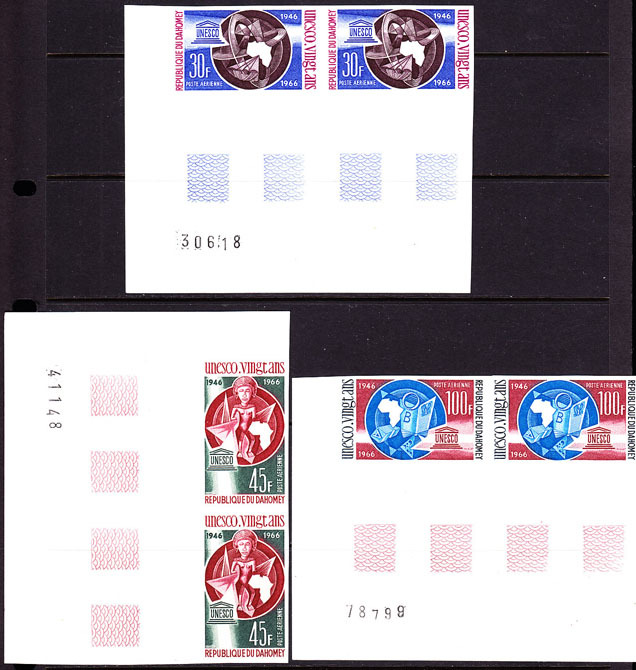 Imperforate souvenir sheet of 3. Scott No C184a, Yvert No BF21. 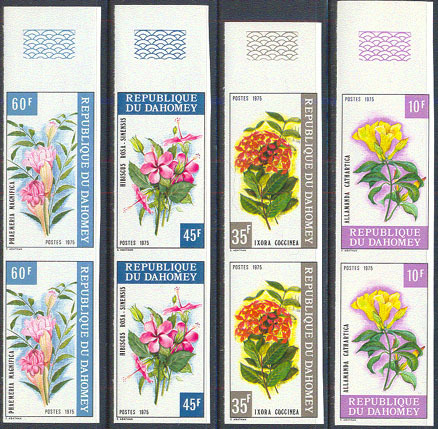 4181 ND DAHOMEY (1975) Flowers*. Set of 4 imperforate margin pairs. Scott Nos 342-5, Yvert Nos 360-3.